The year 2015 marks the 20th Anniversary of a great journey that took place over the course of 8 months as a band of pilgrims guided by traditional elders of North America walked from the Atlantic to the Pacific under the sky sign of the Whirling Rainbow. 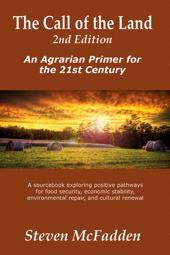 This journey was a response to the urgent call of the land. I invite you also to begin the journey. 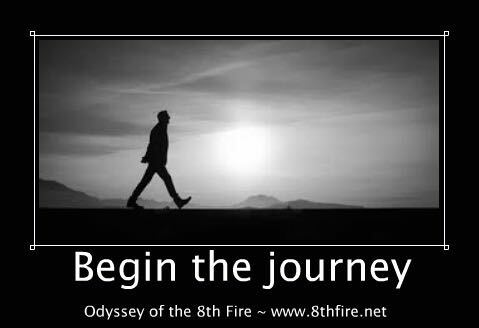 Explore what the odyssey of the 8th fire is about, and consider making an 8-month spiritual-literary journey, reading one journal entry each day from the start of the odyssey onward. 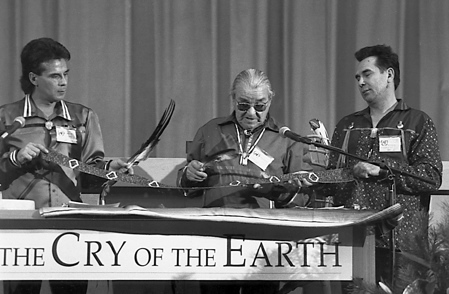 At the UN - Grandfather Commanda (center) displays the Seven Fires Wampum Belt at The House of Mica - UN headquarters on Manhattan Island. Frank Decontie (L) and Eddie Decontie (R) help hold the belt. Dear Relatives -Grandfather William Commanda died early Wednesday morning, August 3, 2011, two days before the start of his annual gathering in Maniwaki, Quebec, Canada. He was 97 years old. 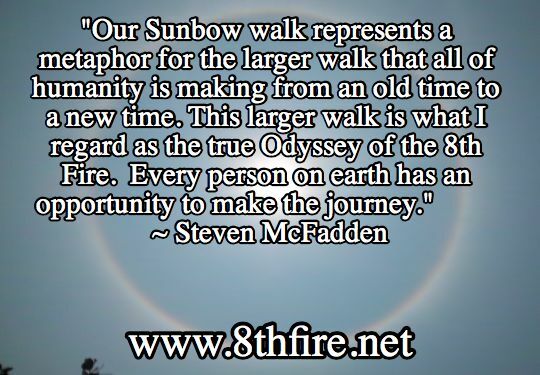 Among the many accomplishments in his long life as a protector and defender of the land, Grandfather served as Spiritual Advisor to the Sunbow 5 Walk for the Earth in 1995-95, a walk chronicled in Odyssey of the 8th Fire. The story of Grandfather’s leadership of this epic walk is also at the heart of the project to create an audiobook based on the nonfiction Tales of the Whirling Rainbow. I am honored to have known Grandfather, and to have traveled with him, since 1989. He was a remarkable man with a brilliant soul. 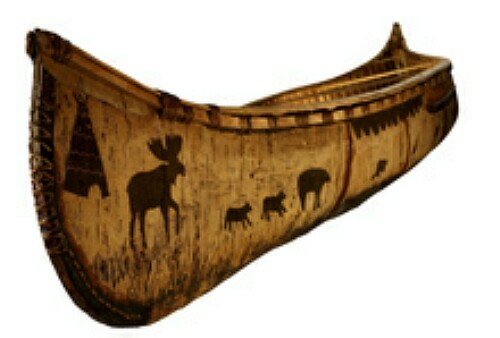 One of the many birchbark canoes Grandfather Commanda built over the years. In my memory, one vivid picture of Grandfather’s resolute nature comes strongest. It was 16 years ago: Friday, November 24, 1995 in the desert to the west of Rio Rancho, New Mexico. We’d been on the road a long time. It was Day 155 in the Sunbow 5 Walk for the Earth (the Odyssey of the 8th Fire). In his 80s at the time, Grandfather served as Spiritual Advisor for the walk and its epic quest across Turtle Island (North America). Grandfather was leading us from Atlantic to Pacific to meet with and learn from wise elders of all traditions, and to seek out “what had been left by the side of the trail long ago” as described in the Seven Fires Prophecy. But our grand pilgrimage for peace and unity had hit the wall of human nature by the time we got to New Mexico. We had been arguing viciously among ourselves, and fractured into four or more groups — each group filled with suspicions and hostility. As we arrived at a desert knoll to circle up for our council and air our ferocious grievances against each other, the wind rose. 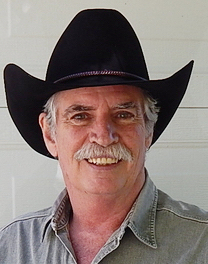 It blew so hard — 45 to 50 mph — that the air literally began to scream across the desert. The unrelenting desert gale blew stinging sand into everyone and everything. The storm rocked across the desert with howls and jerks, whipping ceaselessly through our gathering as we huddled low on a dune, seeking a windbreak. We prayed. In this manner it was settled. We were all to walk together — one reconciled, reunited walk. With the help of his companion Romola Treblecock, Grandfather Commanda developed his own website, a Circle of All Nations. 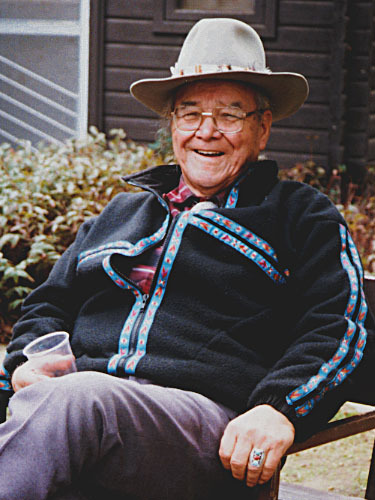 Among the many treasures in his spiritual legacy to the people, he left his vision for Asinabka – an indigenous guided island for personal and planetary healing, located downtown in the river that runs through the heart of Ottawa, Ontario and Hull, Quebec. Grandfather Commanda’s final vision is only part way to fulfillment. It needs wider support to come to full realization.